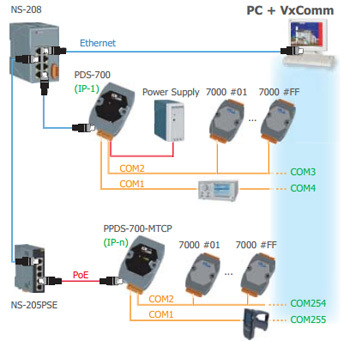 Programmable Device Server and Modbus TCP / Modbus RTU Gateway with PoE Power over Ethernet option, 7 RS-232 ports, 1 RS-485 port and 80 Mhz processor. Din rail mountable. Can be piggy back din rail mounted on top of other modules.